By resolving the contradiction at the heart of such educative problems, students experience the transformation Gregory Bateson (1972) outlined in his hierarchy of learning, a process of five stages beginning with Learning 0, characterized by “responding to stimuli but making no changes based on experience or information” (Tosey, 2006, p. 6) and leading to Learning IV, which “probably does not occur in any adult living organism on this earth” (p. 3). While Learning IV may be seen to represent the evolution of a species into a genetic descendent, the crux of Bateson’s transformative learning arises in Learning III, which learners encounter “driven by contraries at level II” (p. 3). In presenting Bateson’s hierarchy as a possible framework for transformative learning, Tosey frames this view of Bateson by citing Bredo (1989), observing that “The ‘problem’ to which third-order learning is a ‘solution’ consists of systematic contradictions in experience” (p. 35, as cited in Tosey, 2006, p. 3). It is here that we glimpse the limit-situation described by Freire (see: Chapter 1), and after which the critical praxis is begun again anew. Reconciling a view of curriculum within such an emergent sense of knowledge presents a similar challenge to the “third-order learning” needed to cultivate an evolving multicultural citizenship, and it is unsurprising to find an orientation toward process-oriented, critical solutions is suggested to best resolve contradictions in each of these domains. Schools striving to prepare young citizens for participation in the democratic process ought consider the fluid state of citizenship in the national sense, and reflect on how this view is represented in the school space. In addition to crafting a curriculum suited to enabling critical and emergent learning, schools in such pluralist democracies “are expected to celebrate the diversity of the student body, but also to minimize it by developing civic capacity and a host of shared dimensions” (Ben‐Porath, 2012, p. 382). Ben-Porath confronts this tension with an “alternative, national membership […] conceptualized here as shared fate – a relational, process-oriented, dynamic affiliation that arises from the cognitive perceptions as well as from the preferences and actions of members” (p. 382). By conceiving of citizenship as shared fate, schools are able to formulate a curricular response consistent with principles of emergent knowledge and Freire’s critical praxis. Citizenship is no longer a vision of national unity or virtue, but exists as the assemblage of “visions, practices and processes that make up the civic body through engaging individuals and groups in the continuous process of designing, expressing and interpreting their membership in the nation” (p. 382). 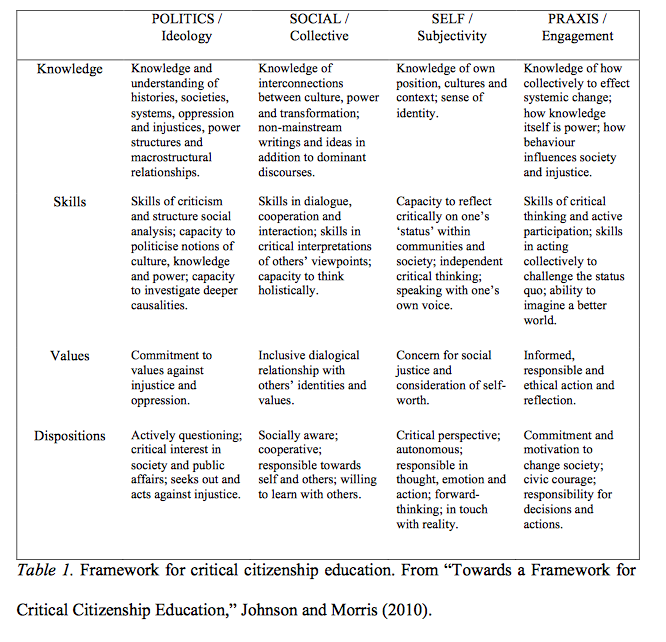 Johnson and Morris (2010) suggest a framework (see table 1) for such critical citizenship education by synthesizing literature concerned with citizenship education, critical pedagogy, and critical thinking “for analysing and comparing curricula which promote forms of critical citizenship” (p. 90). In a table highlighting distinct elements of critical pedagogy on the horizontal-axis, and “Corgan et al.’s (2002, 4) useful definition of citizenship/civics education as ‘the knowledge, skills, values and dispositions of citizens’” (p. 87) across vertical categories, the authors present “a working, flexible model of critical citizenship, open to reinterpretation and adaptation” (p. 90). The authors suggest the base knowledge, skills, values and dispositions in addressing elements of critical pedagogy: the political, social, self, and praxis, creating a point of departure for the unit framework presented here.